Hi Folks Patrick Page here with Flag-Works over America How are you doing today. I’m here today to talk about the Alaska state flag More than 30 years before Alaska became a state, they held a design contest for a flag. A seventh grade Aleut student, John Bell Benson known as Benny won that contest. the design had a blue background to represent the sky and the Forget-me-not flower. On that background were placed eight gold stars to represent the Big Dipper and the North Star. The Big Dipper forms part of the constellation Ursa Major or Great Bear; symbolizing strength. The North Star is the perfect representation for the future state of Alaska, it being the most northerly state in the Union. This entry was posted in State Flags and tagged alaska, facts, flags, funny, history, interesting, state flags on January 12, 2018 by Patrick Page. Flag of Heroes: Made in the USA includes the names of all the Emergency Services personnel, including FDNY, PAPD, and NYPD & COURT Officers. Patriot Day is an annual observance on September 11 to remember those who were injured or died during the terrorist attacks in the United States on September 11, 2001. Many Americans refer Patriot Day as 9/11 or September 11. The flags are a historical marker to the events of 9/11 which is one of the most significant events of our lifetime. They give people a tangible connection to that day. Since flags are used as symbols in our country and a flag can be framed or flown it was the best way to create a lasting tribute that the public could embrace on an individual level. The American Flag is often displayed around images of the events on September 11, 2001. This is to remind Americans that their country remained strong in the face of massive terrorist attacks. The Flag of Honor and Flag of Heroes are in stock at Flag-Works over America. You can place your order online or with a customer service representative at 1-800-580-0009. Please remember: all flags purchased online ship for free. This entry was posted in Civilian Flags, Uncategorized and tagged american flag, american flags, american flags for sale, buy american flags, flag, Flag of Heroes, Flag of Honor, Flag-Works, flags, Made in the USA, Nylon on September 7, 2016 by admin. Applique Custom Flag. This one was made for a repeat company. If your company is looking for great looking applique flags made, Flag-Works is here for you. APPLIQUE– These beautiful flags and banners reflect the truly fine craftsmanship available from Flag-Works over America. (Applique Gallery) Applique requires extensive seamstress work in producing each flag or banner. We use a 200-denier nylon to create your design. The results are both attractive and luxurious. Choose from a variety of elegant colors to make your flag or banner truly outstanding. This process has a minimum of one piece and is usually not recommended for large quantities. Applique is priced by the intricacy of the design. This entry was posted in Applique Custom Flag, Custom flags, Uncategorized and tagged Company Logo Flags Custom, custom, custom applique, Custom Applique Flag, custom banners, Custom Flags, Custom Logo Flag, Custom made flag, Custom Nylon Flag, Flag-Works, flags, Logo Nylon flag, Made in the USA, Nylon, Nylon Applique Custom Flag on April 7, 2016 by admin. 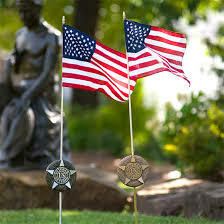 Flag-Works provides quality made Grave Marker Flags. These grave marker flags are just the right size for the Veteran’s grave markers that are available in brass or plastic. They are 12″ x 18″ all edges are sewn, mounted on 30″ wooden shaft with wooden gold finial. Cemetery flags are made using a poly/cotton material, are sewn (hemmed) on all four sides and are Made in America. This entry was posted in Grave Marker Flags, Grave Markers and tagged cemetery flags, Flag-Works, flags, Grave Marker American Flags, grave marker flags, gravemarker flags, Graveyard Flags, hemmed grave marker flags, Made in the USA, memorial grave marker flags, spear top grave marker flags, us cemetery flags, US Stick Flags on February 24, 2016 by admin. Football Fans are you looking for a New Flag for your House or Garden you are looking in the right place. Flag-Works has a good stock in NFL team flags. You can also visit our Ebay store that has some listed as well. This entry was posted in Sports, Uncategorized and tagged Flag-Works, flags, Football Banners, football flags, Football Garden Flags, NE Patriots, NFL Banners, NFL Flags, NFL Garden Flags, Sport Banners, Sport Flags, Sport Garden Flags on August 21, 2015 by admin. We love hot summer days. Our hot summer sale on American flags is going on right now with free shipping on flag orders placed through our website. This entry was posted in American Flags, Flags, Uncategorized and tagged american flag, american flags, buy american flags, flags, sale on August 1, 2014 by Courtney. During the days of June 8th-16th, 2013 many Americans will be riding their motorcycle’s to Laconia New Hampshire for the annual motorcycle rally. During this week hundreds of thousands of people will come to our great state to join in the festivities that are held all week long. For those of you motorcycle enthusiasts who will be taking in the scenery by riding around our beautiful state, ride on down the capitol city of Concord, check out the Hall of Flags in the State House building, then stop by our retail location and say “Hi”. We welcome all bikers and tourists alike. Our store is located just down the road from State House on the downtown strip at 6 North Main Street. We encourage you to come on in and check out our inventory of american flags along with many historical flags, and and all of the country’s state flags. Inside Flag-Works over America is American Cowboy Supply. American Cowboy Supply provides New Hampshire and beyond with Western Boots by Justin, Ariat, Dan Post, Laredo and Dingo. We welcome anyone and everyone to come by and check us out in person or online at Flag-Works.com. You can also like us on Facebook and follow us on Twitter! This entry was posted in American Flags and tagged american flag, buy american flags, concord, Decorative flags, Flag-Works, flags, Historic flags, laconia, motorcycle, motorcycle week, N main st, New Hampshire, NH, open flags on June 13, 2013 by admin. Located just a few blocks down from Flag-Works over America in Concord, New Hampshire is the state capital. The building was designed by architect Stuart James Park, and built between the years of 1816-1819. Inside the main lobby area of this historic building is the Hall of Flags formerly known as Doric Hall, which was named and designed after a similar display in the Massachusetts capitol building by Charles Bulfinch. The halls feature over 100 battle flags carried by New Hampshire soldiers, representing the Civil War, Spanish-American War, WW I, WW II, and the Vietnam War. The flags surrounding you go back to our nations infancy. Some of these flags are so old that there isn’t barely anything left of them, others are torn and tattered due to going through the riggers of war. Many of the flags in the hall are here today because of those who gave their life to protect these flags and what they stand for. All of the flags have a story, and this room is not lacking. Some of the flags are from different states, some are from foreign countries and some are from our country. It is quite a site to see to be in the same room inches away from a flag that may have been held by such important people like Franklin Pierce the 14th president of the United States and General John Stark, as well as many other people who founded this great country. Just like the men who fought to protect the flag then, we have men and women now who fight to protect our flag today. Our hope is that one day some of the flags that they fight to protect may be added to this room full of historic flags. 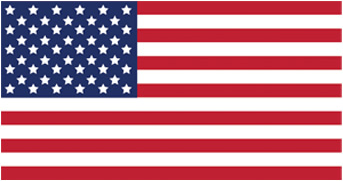 This entry was posted in Historical Flags, New Hampshire State Flag and tagged american flags, flags, Franklin Pierce, General John Stark, Hall of flags, Historic flags, international flags, New Hampshire, state flags on June 13, 2013 by admin. First introduced on Continental Naval ships in the fall of 1775, The First Navy Jack Flag consisted of 13 red and white stripes which were to represent the 13 colonies. Historically there isn’t an exact date as to when the flag changed, but sometime in the years that followed the flag was altered to what it is known now which is 13 red and white alternating stripes with and uncoiled rattlesnake imposed over the stripes with the motto underneath stating “Don’t Tread on Me”. The flag with the rattlesnake and motto on it have typically been used since 1880. The snake is meant to be a symbol of resistance towards the British from the time of Colonial America. The Phrase of “Don’t Tread on Me” was introduced during the Revolutionary War, also the meaning behind the phrase is simple in that a snake doesn’t strike until provoked. Other flags that The United States have used over the years that also depict a snake are flags like The Gadsden Flag, and The Culpepper Flag. All three of these flags play a role in the progression of flags and their meanings throughout American flag history. This entry was posted in Historical Flags and tagged 13 Colonies, american flag, american flags, American history, flags, Naval History, Stars and Stripes, The Culpepper Flag, The First Navy Jack, The Gadsden Flag on June 6, 2013 by admin.